Gone are the days when being grounded or having your pocket-money deducted was deemed a suitable punishment. Now a father has shared his particular method of discipline and it involves the extremely grave threat of restricting his children’s internet access and cutting off their phone plans. Transcribed for anyone who has trouble reading it from the picture. ‘I don’t know who you are. I don’t know what you want. ‘If you are looking for a maid to clear up for you, I can tell you I don’t do that. 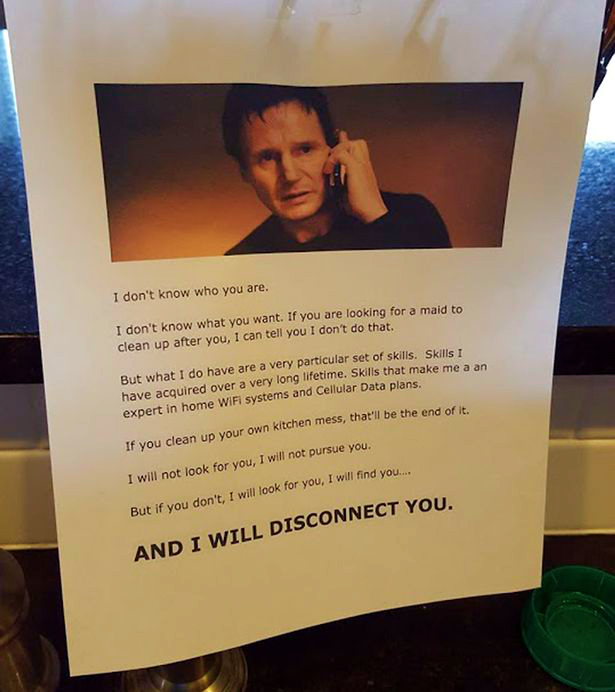 But what I do have are a very particular set of skills. Skills I have acquired over a very long lifetime. Skills that make me an expert in home WiFi systems and cellular data plans. ‘If you clean up your own kitchen mess that will be the end of it. I will not look for you, I will not pursue you. The post on Reddit encouraged a thread of over 3,500 responses and the photo is now being shared widely across Twitter and Facebook. One of a good way to make people clean their dishes. The ultimate threat – Whew! And when they reach 50 they’ll come back, get down on their knees and with tears in their eyes beg: “Please, please, please show me how to get disconnected!” Ha! Hahaha! Love this! Passing it on. I would do this if I was a parent!